Betting on quality, internationalisation and local design, the latest edition of 080 Barcelona Fashion featured 27 catwalk shows, welcomed over 30,000 guests, and left a good impression in the sector. Umit Benan, Turkey’s most famous menswear designer, presented his first collection in 18 months at an insider lunch in his new headquarters, kicking off the Milan season. Tokyo may be the style capital of Asia, but with South Korea and China snapping at its heels and Japan's most iconic brands rooted in Europe, the city is being urged to haul its fashion week into the big leagues. Embattled Donald Trump got two fingers from the most unlikely of places Tuesday -- the Tokyo catwalk at a fashion show inspired by his bete noire: the working Mexican in Texas. The Milan-based Turkish designer, who used to show in Paris with his menswear line since 2014, has decided to stop showing. He explained that he is no longer attuned to this kind of ritual. Paris Men's Fashion Week, running this Wednesday 21 to Sunday 25 January, has 47 names on the programme and some 15 presentations to be given. 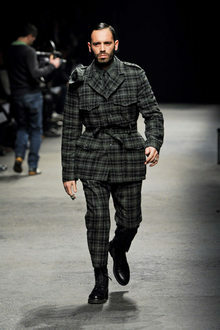 Trussardi marked its return to the Milan catwalks on Friday with a lavish night-time spring/summer 2012 show on the theme of airline travel held in a courtyard of the landmark Sforza Castle.